Rectangle Flags are supplied with burnished aluminium poles and provide a vibrant, eye-level event branding opportunities for indoor and outdoor audiences. 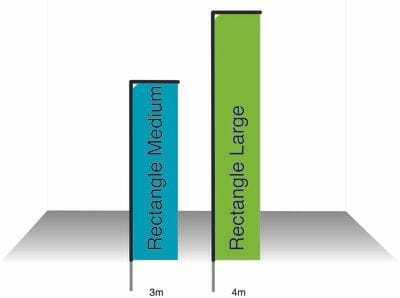 Rectangle Banners are available in sizes Medium and Large. Most commonly seen at car yard sales, beach, local market stalls, outdoor events and sporting events these flags are the perfect way to get your brand noticed.